Much like the first book in the Crescent Chronicles series Focus is sure to blow you away. Flight, (the first book in the series), was an adventurous journey into Allie Davis s life. 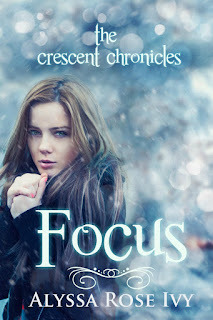 In Focus, Alyssa Rose Ivy manages to capture perfection in this endearing, well worth your time, and jaw dropping sequel. You can't help but be enraptured with Allie's snarky since of humor and Levi's unrelenting cockiness, with all the events that are revealed. I will say that at the ending of the book there is a big shocking surprise with one of the characters. Ultimately this book deserves an A+ for my mind officially being blown away, but what else can you expect from an author who has a way with words. The newly anticipated sequel in the Crescent Chronicles, Found, is sure to blow us all away on July 16th.